Following on from a visit to Sedgley’s Beacon Hotel earlier this year, it seems local legend AJW, renowned for leaving beermats in pubs featuring a drawing of 1950’s star Mario Lanza, has been getting hungry for more exposure. Anthony Arnold, a regular reader of Sedgleyscene, was amazed to discover the mysterious artist’s latest calling card drawn on an empty box of chicken pies in the somewhat unglamorous surroundings of a local Morrison’s supermarket toilet. Could this be the latest calling card from the mysterious AJW? Impressed by his discovery, Anthony took a picture, which is posted here. 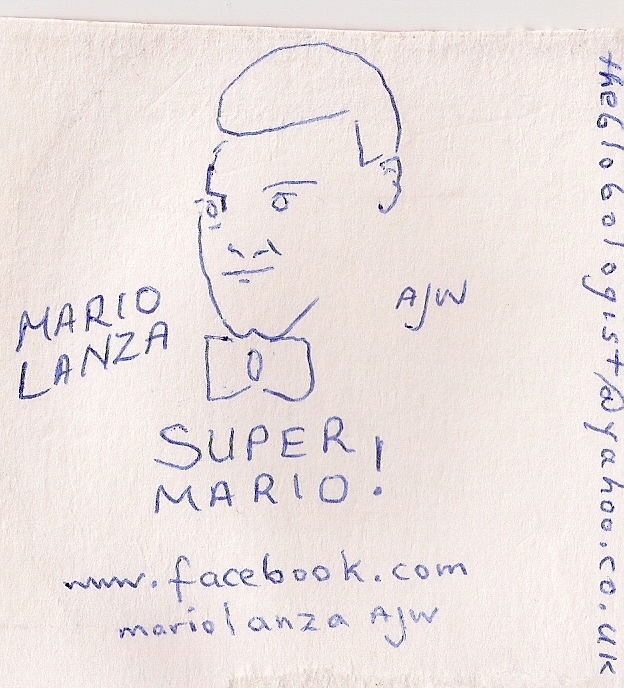 All the trademark signs are there – the line drawing of Mario Lanza, together with this anonymous artist’s Facebook page and email addresses. However, Tony is unsure as to whether this latest offering is the real deal and is appealing to Sedgleyscene readers to help. The mysterious drawings, which have been appearing on beermats in pubs since the 1970s, have continued to baffle local residents. No-one seems to know why each inscription by this phantom artist – who simply calls his or herself AJW – bears a dedication to Mario Lanza, a famous American tenor singer and actor who died in 1959. This enduring mystery has led to a Facebook page being set up in this mysterious character’s honour which now has 172 members. It seems AJW also likes to get around, leaving calling cards in pubs and other public buildings across the Black Country and Birmingham – often with personal dedications to members of staff. Some avid followers of AJW also believe there could be several artists at work – especially as the original phantom would now be more than 80 years old – but no-one has been able to confirm this. Can you help Sedgleyscene and Anthony confirm this latest discovery? Get in touch with us at sedgleyscene@gmail.com We’d love to hear from you. one was also found in Asda Brierley Hill about 4wks ago. I saw it but i’m not sure what happened to it as the security guard had it last. However i did get a good look at it. It was also on the back of a cardboard food box, A vegetiaran one and was found in a leaflet holder by the cigerette Kiosk. Many thanks Louise – it seems our mysterious artist likes to do his or her shopping in several supermarkets across the region! Kind regards, Chris. I just found one this week, Sept 5th, on a shelf in the Severn Hospice charity shop in Oakengates, Shropshire. Written in red felt-tip, on the back of a Bathams beer-mat.